When it comes to the youngest members of our community, we want to make sure their wellness is taken care of from the moment they arrive in this world. It takes a while for a baby’s immune, respiratory and central nervous systems to fully develop; they absorb products through the skin more easily; and even their sense of smell is different. Generally speaking, the younger the child, the more delicate and sensitive they will be. 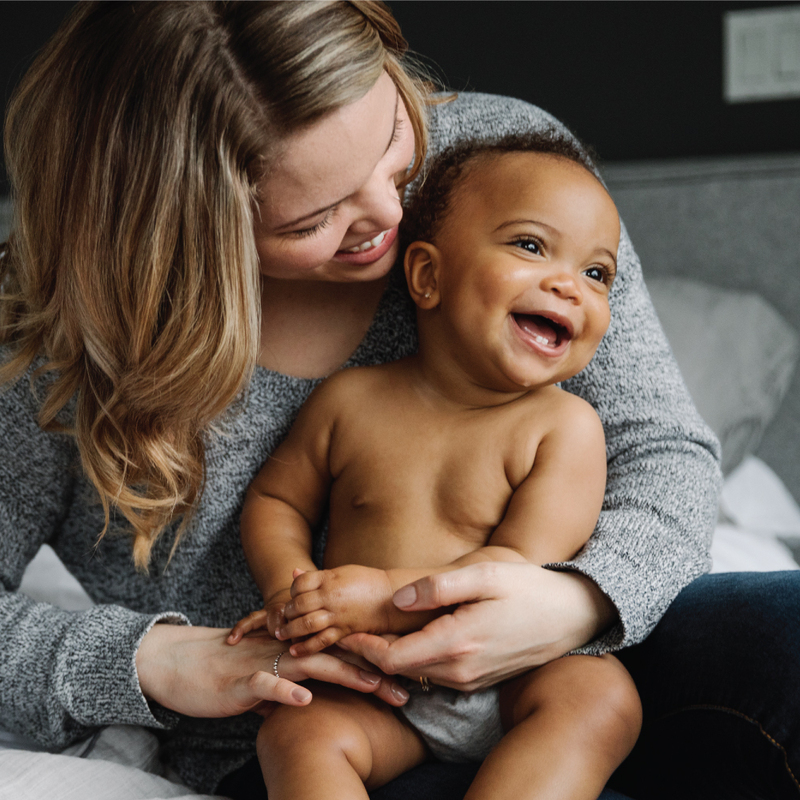 With so many different opinions floating around about whether essential oils are safe to use with babies and children, how can you be sure you’re making the best choice for your family? No matter what you’re introducing into your baby’s new home, you want to make sure it’s not doing any harm. Since their little bodies are much different (and much more sensitive) than our adult ones, we always recommend checking with your pediatrician when considering how to keep your little one well. We looked at research from aromatherapy experts like Tisserand and Young, and the National Association for Holistic Aromatherapy to find the safest way to enjoy essential oils while you nurture your family the natural way. Ultimately, however, you’re going to be the best person to decide what’s best for your family. Use the information below as a guide for how to use our products when you have babies and children in your life. Read everything. Look closely at what is listed on product labels, especially the safety precautions. The information on the labels is mandated by the federal government, and is there to keep you and your family as safe as possible. In Canada, many of our essential oil blends are licensed as Natural Health Products, and are recommended for use by adults (age 18 and over). This recommendation may be different from what you would receive from a certified aromatherapist. Choosing what advice to follow for your growing family is best left to the expert: you. Avoid ingesting to their reaction. It’s unanimous: neither the FDA in the US nor Health Canada recommend ingesting essential oils, and neither do we. None of our essential oils or essential oil blends are intended for internal use by anyone. As a rule, unless a product is specifically designed to be food, it’s best no one eats it. Pay close attention. If you decide to add a new element to your child’s environment, monitor their reactions very closely and make sure there is fresh air available at all times. When it comes to understanding whether or not a new product is affecting your child in a negative way, you’ll know best. This is just an overview of where you might want to start when introducing essential oils into your child-friendly home. Specific product references by age are included in the sections below. Keep in mind that single note essential oils are recommended for use by adults only. Birch (sweet), also known as wintergreen is high in methyl salicylate, which is only recommended for adults with specific therapeutic needs. Eucalyptus has a strong effect and may be too much delicate, developing bodies. It contains a component called 1,8 cineole that may cause laboured breathing in children under 10 years of age. In the first few months of life, babies are getting used to all kinds of new sensations, including light and air -- imagine taking your first breath after emerging into the world! It makes sense, then, that some extra-special care should be taken to avoid overloading their senses. We recommend steering clear of adding essential oils to what you’re putting on their skin or adding to their air. The gentle mist of an ultrasonic diffuser is a simple and effective way to enhance the wellness of a space, even without essential oils. Just add water, turn it on and breathe in the supportive water vapour to the air you and your family breathe. With young children in the home, we recommend using just water in your ultrasonic diffuser, without essential oils, and introducing blends when they’re a little older. Choose an ultrasonic diffuser with an intermittent setting like the Aroma Peak, which has been designed with the recommended interval settings built in. After 1 hour of continuous misting or 30 mins on and 30 mins off of intermittent misting (an approximate span of 13 hours), this unit turns off. This means you can slowly introduce essential oils once your baby is at least three months old. Remember to always keep your diffuser well out of reach of little hands. All of our Baby Care products can be used at this stage of life, with the exception of Mini Moisture. Keep in mind your baby’s system will be very delicate in the first three months, and may not need any type of product at all. Lavender Mist or Rose Mist can be used on bedding: just make sure to avoid misting directly on your little one. When they are in another room, mist lightly and allow it to fully absorb into the fabric before re-introducing your baby. This will freshen bedding while minimizing possible irritation to their delicate bodies. Jojoba Oil is a neutral, skin-friendly oil that can be used as a moisturizer or a massage oil. Sweet Comfort Soap, made with a nourishing honey base and contains no essential oils, creates gentle, skin-soothing suds for skin of all ages. Now that your little one is not quite a newborn anymore, you can consider adding Citrus Dream Diffuser Blend to your ultrasonic diffuser. Choose an ultrasonic diffuser with an intermittent setting like the Aroma Om, or the Aroma Peak designed with little ones in mind. Run the unit for 30-60 minutes on, then turn it off for 30-60 minutes (the Aroma Peak can be programmed to do this on its own). Remember to always use your ultrasonic diffuser in a well-ventilated space, and keep the unit well out of reach of little hands. All of our Baby Care products, including Mini Moisture, are gentle enough to used with all little ones between the ages of three months and two years. Once the three-month mark has passed, you can also use our all-over moisturizer, Sentiva, formulated with rose to soothe both your own dry skin and your baby’s. Well-loved by our community for 25 years, Fairy Mist can also be added to your natural care options. Young kids have delicate systems until at least the teenage years, so the products we recommend for children as young as three months old stays much the same for kids ages 2 to 6 years. You can feel safe using any of the products recommended for younger kids, above. Now that your bundle of joy is a toddler, you can consider adding more diffuser blends to your wellness routine: soothing and calming Aroma Fairy, and uplifting, floral Bloom, in addition to other community favourites like Chill Out, Embrace, Goddess, Liquid Sunshine and Unwind. As always, only diffuse in a well-ventilated space, and keep the unit well out of reach of little hands. Another mist option for this age range is Tranquility, which can be misted on bedding to help kids drift off to sleep. Gentle bar soaps like Eczema Ease, Parisian Garden, Lavender Love and Lavender Lustre are great options for cleansing little bodies. Before adding any product to your child’s life, we always recommend speaking with your child’s health care provider. When adding essential oils into your baby’s wellness routine, check with a certified aromatherapist for advice. That way, you’ll have all the available information you need to make a decision that aligns with your and your family’s needs. We are always available in store and through our customer service centre to help you choose products that are best for wellness lovers of all ages.